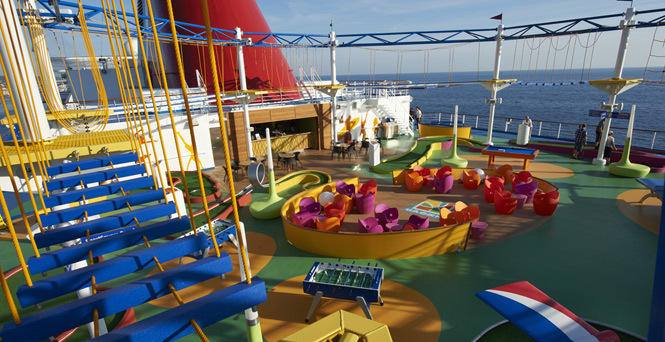 Carnival, “The World’s Most Popular Cruise Line”®, enlisted the professional expertise of Prime Play to bring an active family attraction to its newest ship, Carnival Magic. Launched in May, the massive 130,000-ton “floating resort” is the first cruise ship ever to feature a ropes course designed and installed on board. Featuring Prime Play’s unique Sky Trail® Ropes Course, guests can take advantage of an active on land type family excursion in a distinctive shipboard environment. Incorporating two parallel tracks – one easy, one difficult – the custom-designed Sky Trail® creates a fun family cruising experience that offers a 360-degree view while suspended 150 feet above sea level. Located above the top deck SportSquare complex, each family member can traverse through their own course at their own skill level, while still participating in the same active experience together. Prime Play’s Sky Trail® both challenges participants and keeps them completely safe, harnessed into the closed tracking system above. This custom truss system was also designed to decrease the amount of weight on the deck and reinforces Prime Play’s and Carnival’s shared commitment to providing “safe, family fun. 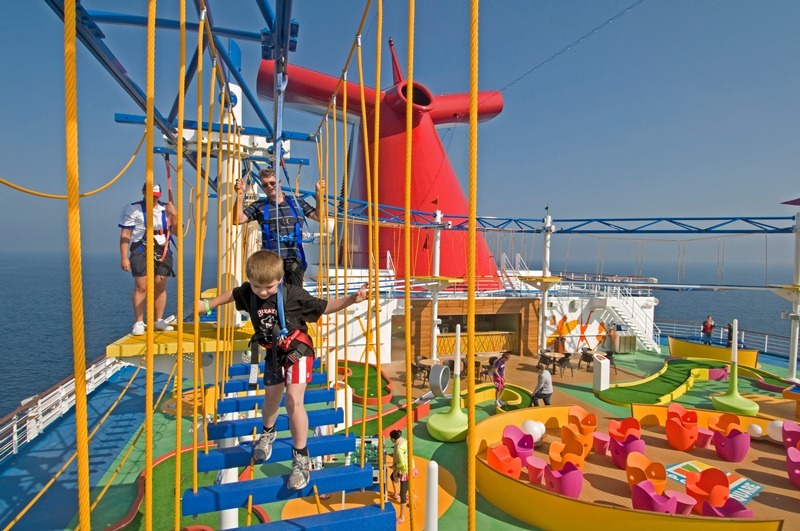 Carnival Magic’s ropes course was specially built by Prime Play’s team of experts to withstand harsh marine elements, such as sea water and UV exposure, while enhancing Carnival’s “Fun Ship” brand promise and ensuring the highest standards in the cruise industry. As the world leader in the design and manufacturing of dry play systems, Prime Play is proud to have been part of this “latest and greatest” cruise attraction and we very much look forward to working with Carnival on future projects. For more information on Prime Play and their suite of innovative new products, please visit www.primeplay.com.